The Sultanate of Oman has gone through a tremendous development over the last four decades and envisions more environment friendly and sustainable infrastructure. As a result of this infrastructure development, quantities of several types of waste have dramatically increased. Recently, the use of waste materials as a soil additive has become widespread. Nevertheless, in Oman marble waste generally ends up in municipality dump sites. Recent practice has demonstrated partial replacement of marble waste for soil stabilization. This paper explored possibilities for the sustainable invigoration of marble waste as an environment friendly recycled material in Oman. In this study, marble waste powder was mixed with desert sand at various proportions and the strength, deformation, compaction and permeability characteristics of sand-marble waste mix were elucidated. Triaxial test results indicated an increase in strength and deformation response by the addition of marble waste in sand. Further, a decrease in permeability was observed by the addition of marble waste. The strength parameters obtained were utilized to calculate the bearing capacity for shallow foundations. The geotechnical properties of sand-marble waste mixes elucidated in this study reveals that the waste marble if mixed with sand, not only increase the bearing capacity for shallow foundations in desert but also eliminates its disposal at the landfill sites. The present research was carried out under the financial support provided by the Research Council of Oman under the FURAP grant awarded in 2015. 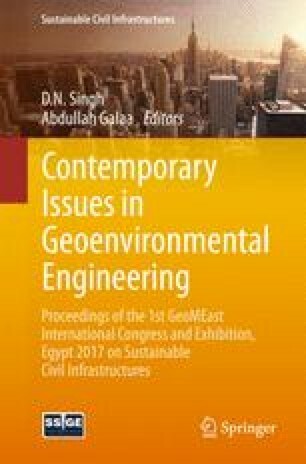 The authors are also indebted to the technicians at Sohar University for their support in the performance of experiments. The authors are thankful to Al-Turki Enterprices L.L.C., Sohar Industrial Estate, Sohar, Sultanate of Oman, for allowing the visit to the facility and permission for the collection of marble waste powder.